Plum pudding is a traditional English Christmas dish. Why don't you try this festive treat on National Plum Pudding Day, that is celebrated on February 12? Although plum pudding is known to be British, some would say the fruit selection makes it an Irish treat. Plum pudding is made of raisins, nuts, nutmeg, cinnamon, apples, dated, currants, cloves, chopped mix of candied fruits and many other ingredient. You must have noticed that we didn't mention plums. Actually plum pudding doesn't contain them. In the 17th century, when the recipe of this treat was created, plums referred to raisins and other dried fruits. During the Puritan reign of England this treat was outlawed as far as it was considered “sinfully rich”. Today no one will prohibit you enjoy this sinfully delicious pudding. Did you know that there is a nice English tradition: every person of the family simultaneously holds onto the wooden spoon together to help stir the batter? As everyone does it, they have to make a wish. 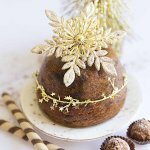 If you want to celebrate this day, find your grandmother's old plum pudding recipe and make it to share with your friends and family.